Americans commonly pronounce the Shih Tzu as SHEET-zoo ; however, the actual original Chinese translation is, "sure-ds." Sixteenth century documents and paintings show dogs resembling the Shih Tzu. The Shih Tzu is said to have descended from crossing the Lhasa Apso or Tibetan mountain dog and Pekingese, in the city of Peking in the 17th century. It was not until the 1930s that the first pair was imported to England, when it was discovered by English soldiers during World War II. •	This popular breed is lively, alert, happy and hardy. •	A real character and loving personality. •	Gentle, loyal, make friends easily. •	Fairly easy to train. •	Can be challenging to housebreak. Patience and consistency here. •	Come in a variety of colors. •	Can develop the 'small dog syndrome' and if allowed can become nippy, but this is rare trait. •	Not always great with unruly children. •	Require daily grooming, and/or professional grooming. •	Have sensitive eyes ~ you need to keep a topknot tied to keep hair out of their eyes. •	Keep Dog hair cut back and away from eyes at all times. •	Hypo-Allergenic ~ shedding almost zero dog hair ~ great for allergy suffers. •	Also shed very little skin dander. •	do not overfeed this breed ~ easy for these tykes to become 'fat'. 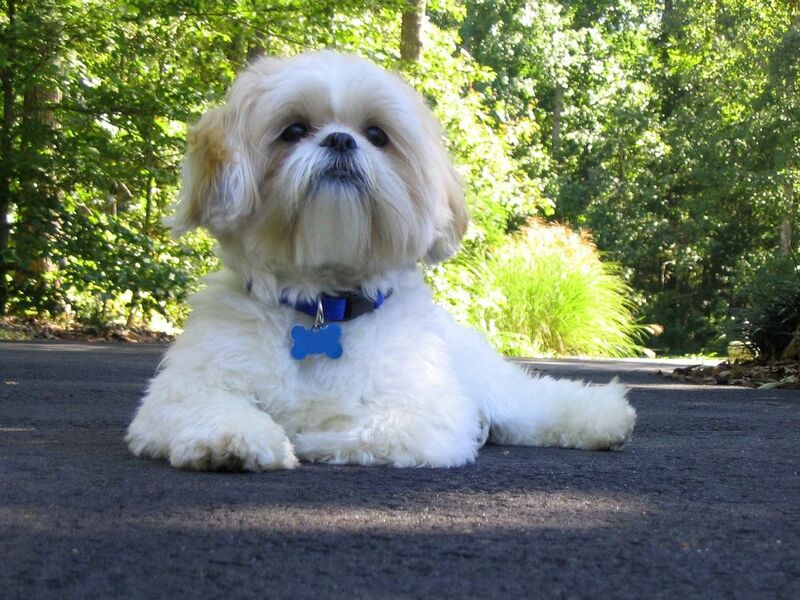 Shih Tzu's are sturdy, bouncy extroverts that make delightful family pet. The spunky but sweet dog is both a gentle lapdog and a vivacious companion. They have an upbeat attitude and love to play and romp. They are affectionate to their family and good with children. They are surprisingly tough and can have a stubborn streak to them. They are a lively watchdog and bark to alert any new circumstances. Because of their fun loving personality, they are usually a great companion not only for people but other animals as well. Introductions should always be supervised but they tend to get along well with everyone. It is important that this breed it kept active in games or just being loved. They like to have a lot if attention and be in the middle of everything. They will be happy to follow you anywhere but with all the hair can be a lot of work to clean up afterwards. It can be quite a sight to watch them romping around with their coat flowing in all directions as they play. Being a people-oriented dog, they cherish being loved and will sit and cuddle on your lap for hours at a time. Much of the elegance of the Shih Tzu is owed to its beautiful flowing coat. In order to maintain this elegant trademark, grooming needs to be done each day. Although 15 minutes a day can sound like a lot of work, if your Shih Tzu learns at a young age it can be easily done and just part of their daily routine. Brushing the hair will keep mats from easily forming. Usually there is a topknot done up with a bow or clip to keep hair out of their eyes and face. Some owners keep their dogs cut shorter to maintain an easier up keep on matting and brushing. The nails need to be kept trimmed to prevent curling over. This breed is an up beat playful dogs. Short walks around the block, is a great way to keep them fit. They love to play games and can be kept inside for activates. They can tend to lie around a lot and it is a good idea to keep them fit and active. Given a sock or other convenient "enemy" your pet Shih Tzu will stalk his prey and quickly run with the prize to another area, often to lie on his back with a sock between his front legs, snatching playfully at the prey with his small jaws. They are great dogs to play fetch with and other dog games. Like housebreaking, training should begin as soon as your Shih Tzu enters the new house. The training sessions should be short but frequent, for example, ten to fifteen minute periods three times a day. This breed can have a short attention span, which makes quick lessons a more enjoyable experience. They are a highly intelligent dog and can be stubborn at times. With patience and a fun atmosphere these dogs are easy to obedience-train. They respond well to praise and treats for rewards on doing a good job. It is important to keep them on a leash or in a closed in area where they can be under supervision.